I have a somewhat formal living room that you land in upon entering my house. To get to any other part of the house at that point, one needs to walk through the living room. My biggest problem is the heavy traffic from the front door, across the living room and down the hallway to the bedrooms. This gets dirty super fast. Any help would be appreciated. Nylon is the best fiber for homes with heavy foot traffic. 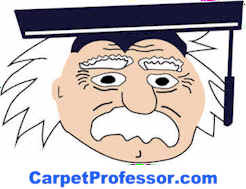 If you need a quick solution right now, The first thing I would do is to get some plastic carpet runners or lay down some area rugs to alleviate some of the abrasion you are getting in those high traffic areas. This is not too costly and will surely help. Also make sure you have a good set of walk-off mats at the outer front door and entryway. Requiring house-slippers for the main family members is another great option. You have several carpet selection options that could work well for you when you are ready to install new carpet. You need to decide how long you want your new carpet to last, and learn what grade of carpet you need to select that is capable to withstand your high level of foot traffic. Q. I have read that the new PET fiber is even more stain resistant than nylon. Your web site indicated PET is the worst. Why is this? Q. Does this price range for new carpet sound reasonable? I am installing a DriCore sub-floor system in the 1,200 SF basement of my newly constructed home. The basement will serve as a family room & play area for my family which includes 2 children under the age of 5 and a de-clawed (front & back) cat. I have been looking for a good quality frieze carpet to put over the sub-floor. What price range should I expect for a good quality Nylon Frieze style carpet? Since you have two young children, and children spill a lot, you may want to consider a lesser grade of carpet and plan to re-carpet in 5 to 10 years. Many people do this because in a few years the children will not be as hard on the carpets and spills and stains will not be such an issue. No carpet warranty covers all types of stains. Either way you go, a nylon frieze is a good choice for you. A good quality nylon frieze carpet starts at about $30 per square yard ($3.33 per square foot) and does not include the cost of padding or installation. Is there a Nylon Carpet Test? Is there a simple test to see if a Carpet is made from Nylon, Olefin or Polyester? Is Using a Power Stretcher to Install New Carpet Important? Q. I got your ebook and it and this website have been very helpful. Based on your book, I even developed my on 45-question worksheet for each and every carpet company I talk to. It’s been a real education. As more anecdotal evidence of why it’s absolutely necessary to get two bids, I called one guy who was listed under carpet layers in the phone book. He said they also like to sell carpet and came out to the house to measure. He then tried the lump sum pricing, which I asked him to break down. He did so reluctantly, giving me the carpet price and the pad price, and saying everything else was installation. It worked out that installation was about $17 a sq. yard. Yikes. I went to another company and without having him to the house asked about installation - $3.50/sq. yard + $1.50 for removal, a bit more for stairs and $2/ft for transition metal (of which we have maybe 20 feet), working out to about $5.50 sq. ft. I called a carpet installation company and their pricing was similar to the second company. Amazing. Thank you for such a nice e-mail. It really makes me feel good to know that I am making a difference with my book and website. Now, to your first question: "In your book and on your site, you strongly recommend a power stretcher. All three companies say they'll use if it needed, but, as a general rule won't for residential work unless there's a 50-foot room. For a smaller room, it doesn't provide as much flexibility in angling (one company showed us a picture and trade article). My response for these guys!" Every year I see and hear about all the great new innovations that the carpet manufacturers come up with. As the next year rolls around, some of those great new innovations from the previous year are long gone. I have a basic rule: Never buy an untried and untested product. This goes for cars, appliances, electronics, and carpet. I usually wait at least three years to make sure that all the bugs are worked out and that there are no unknown and unforeseen problems. This rule applies to Mohawk's Forever Fresh and the new Odor Eating padding products too. I just received a letter from an attorney yesterday who has been forced to move into a motel because their newly installed Odor Eating Carpet has developed a horrible smell. I don't know what the problem is, but the dealer and the mill rep are baffled too. These new products may only cost you more money than you really need to spend. Buyer Beware!